Each year, people around the world celebrate holidays and traditions that are special to their culture or religion. Christmas is celebrated on December 25. Kwanzaa begins on December 26. Hanukkah begins on December 7. 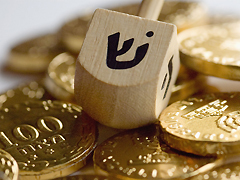 A dreidel sits on top of a pile of chocolate gelt, a treat popular in Jewish holiday tradition. This year, Jews began celebrating Hanukkah at sunset on Sunday, December 6. The holiday lasts eight days and nights. In Hebrew, the word "Hanukkah" means "dedication." Hanukkah honors a struggle that dates back to 165 B.C.E., when Jews defeated an invading army and regained the Temple at Jerusalem. According to legend, Jews found a lamp inside the temple with just enough oil to light their holy lamps for one night. By some miracle, the story goes, the lamp burned for eight nights. Today, Jews celebrate Hanukkah by lighting a candle in a menorah, or candleholder, for each of the eight nights. For more about Hannukkah, click here to view a slideshow. 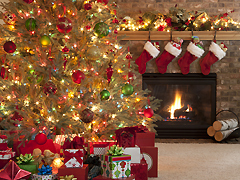 Christmas trees and oversized stockings are symbols of Christmas in many countries. On Christmas, Christians honor the birth of Jesus Christ. They celebrate the day with prayers, gifts, and stories. In one Christmas tradition, a jolly, bearded man named Santa Claus brings gifts to good children on Christmas Eve. Each country has its own traditions for Christmas celebrations. In the sixteenth century, Germans started the Christmas-tree tradition that we are familiar with today. They brought trees into their homes and decorated them with fruits, nuts, lighted candles, and paper roses. For more about Christmas, click here to view a slideshow. A family lights a candle as part of a Kwanzaa tradition. Many African Americans celebrate Kwanzaa to honor their roots in Africa and deepen their connection with their cultural heritage. The holiday is centered around a series of seven cultural principles: unity, self-determination, collective responsibility, cooperative economics, purpose, creativity, and faith., It lasts seven days and nights, from December 26 through January 1. Observers mark each day with the lighting of a candle that represents one of the seven principles. 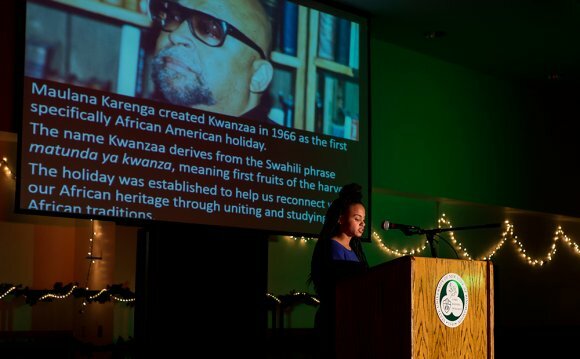 For more about Kwanzaa, click here to view a slideshow. People of many backgrounds and belief systems spend time in December reflecting on the year that is coming to an end, then setting goals and making plans for the new year ahead. The beginning of the dark, chilly winter seems a good time to gather loved ones around a fire or a candlelit table and celebrate the new beginning that we all share at the end of every year.